Nas Bashir will be claiming extra credit for this hard fought win for Hayes & Yeading United as it was his substitutions which tipped the balance in his side’s direction. After a fairly even first half, and a spell of Farnborough pressure at the beginning of the second, the United boss introduced Alassane N’Diaye and Manny Williams to switch momentum around and both scored to lift the team up to fifth place in the league. The game started slowly, as Farnborough enjoyed a lot of possession but couldn’t trouble debutant keeper Brandon Hall with any shots on target. United got into more dangerous attacking positions but were wayward with their shooting as both Daniel Wishart and Calum Butcher cleared the crossbar and indeed the roof of the stand. The first team to come close were the visitors in the 23rd minute as right back, Alfred Bosch rose unmarked at the back post from a Nic Ciardini corner but headed just wide of the near post. Three minutes later, another Ciardini corner led to the first goal scored out of the blue in somewhat controversial circumstances. His corner caused quite a scramble in front of goal as Alan Inns’ header was blocked by Tom Cadmore, the loose ball was headed goalwards by Dave Tarpey and despite Sam Cox’s best efforts on the line to keep the ball out, and the ball hitting the post in the process, the assistant referee signalled that the whole ball had inched over the line. United responded quite quickly with a corner of their own as Luke Williams’ centre was headed goalwards by Cadmore but cleared from just in front of Jerome Anderson as he was pulling the trigger. However, sloppy defending could have led to Farnborough going further in front as Pelé’s pass put Josh Ekim under pressure in a dangerous position and Dan Bennett raced through, only to have his shot blocked by Hall. Just as out of the blue as the opening goal, came United’s equaliser. Dan Spence played the ball forward to Wishart who cut inside with his run and with most of the home fans shouting for him to shoot, he remained calm to beat one more defender before unleashing a firm right footed shot into the bottom corner. Farnborough enjoyed their best spell of the game just after the break and when Tarpey found himself in acres of space with just Hall to beat, only he will know why he chose to square the ball and not shoot, as even his square pass failed to find a team-mate. United struggled to get forward, so Bashir made his first change, N’Diaye coming on for the strangely out of sorts Ekim who will no doubt have benefitted from more game time under his belt after two months out injured. Immediately, his physical presence in midfield became influential and in only his second game for the club, he showed a good understanding with the players around him. United began to show more attacking threat. Luke Williams came close with a volley which rose too high from Spence’s cross and Wishart ran his markers ragged and only referee Simon Knapp will know why he didn’t give what looked like a certain penalty for a clumsy challenge on him by Inns. Thankfully, the decision wasn’t going to matter as much as last week’s denial of a clear penalty. N’Diaye made a sudden burst forward from midfield and slotted the ball through to Kudus Oyenuga before taking his place in front of goal. Oyenuga picked him out perfectly with a floated cross and the former Crystal Palace man powered his bullet header past Craig Bradshaw. Farnborough struggled to respond and both teams made further substitutions in order to find the winning formula. It wasn’t until the 82nd minute when they had another effort on goal and it took a superb reaction save from Hall to deny Bosch as he firmly volleyed Ciardini’s free kick goalwards. Immediately, United broke as N’Diaye controlled the ball under pressure and found Luke Williams in space, his throughball found Wishart who accelerated past his marker but shot over the bar. 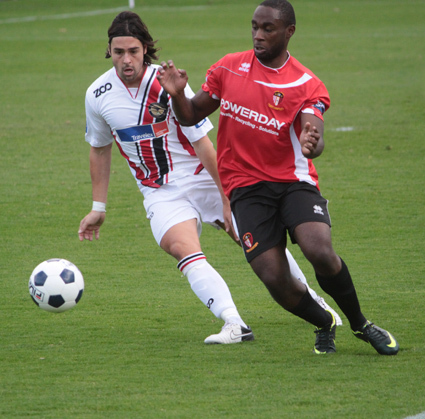 The game was settled in the 86th minute and once again, the substitutes came to the fore. N’Diaye again found Luke Williams, this time on the left hand side and the forward was able to hold onto the ball whilst awaiting support. It came from his namesake, Manny Williams who cut inside and hit a shot which although well directed wasn’t very firmly struck but it still beat Bradshaw at his near post. Farnborough didn’t give up hope and Olly Treacher’s cross was headed out by Cadmore but the loose ball was volleyed towards goal by Medi Abalimba and blocked again by Cadmore. 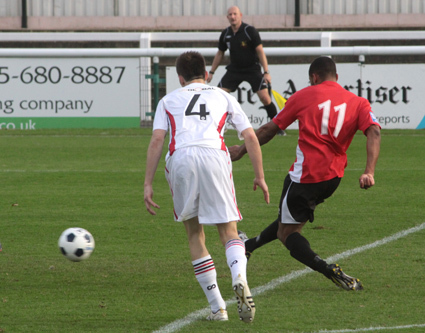 A minute later, a goalmouth scramble from another Ciardini corner led to Bennett hitting a goalbound shot which team mate Elvis Hammond diverted over the bar with a header. 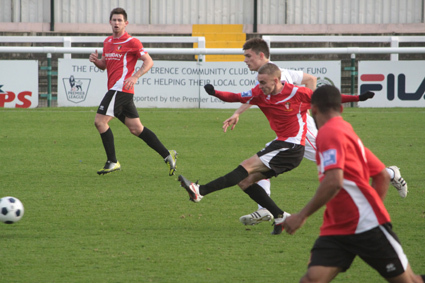 However, they got a consolation deep into stoppage time as a mistake by Spence allowed Reece Connolly to round Hall. The keeper recovered to smother his first shot and a retreating Spence blocked his second on the goal line. 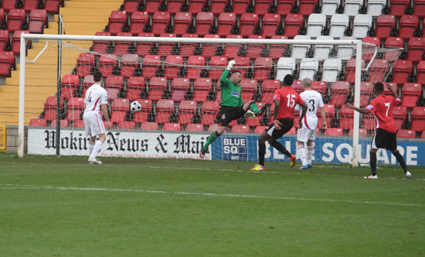 However, United’s defence was powerless to stop Hammond from drilling the ball home. It wasn’t to matter however, as Mr Knapp didn’t allow much more play after the restart and United’s confidence boosting win was confirmed ahead of their trip to league leaders Salisbury City on Tuesday. United Man of the Match: Daniel Wishart.